Another painting from times past…..after all these years, I still really like the feel of this painting. 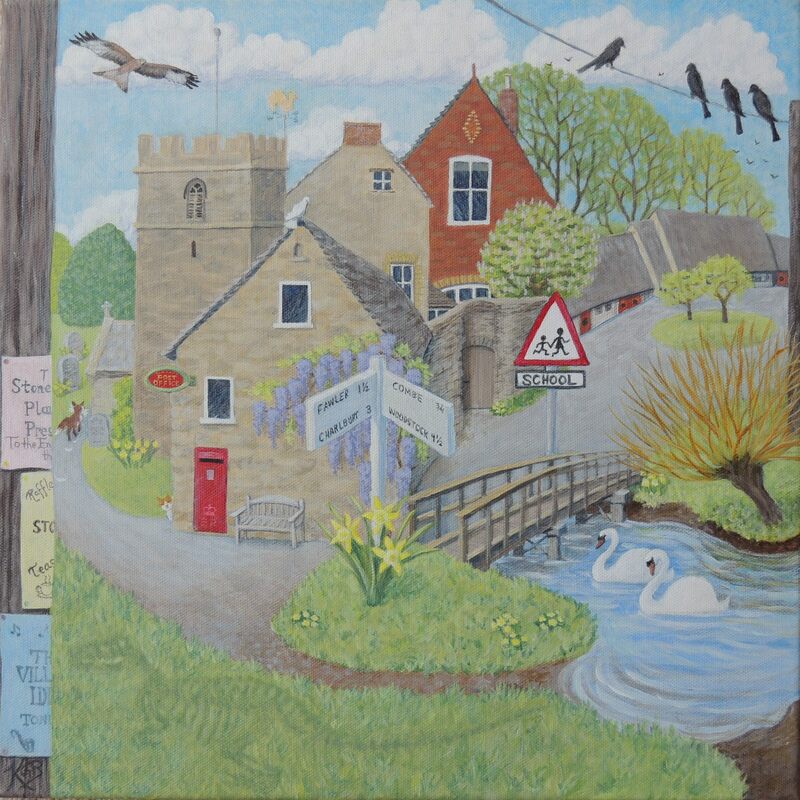 One more for you to see before June is out…this belongs to my sister and is a local area that comes up in a number of my paintings. Something more recent and different: a collage. I can’t remember the last time I did a collage…could be when I was in primary school. No, wait, I think it was when I did a short course at college in the States on teaching art to children. This is mostly white tissue paper painted and torn and a couple other papers, on board, framed behind glass. I produced a few moonlit paintings and a number inspired by the nearby beech wood a few years back. 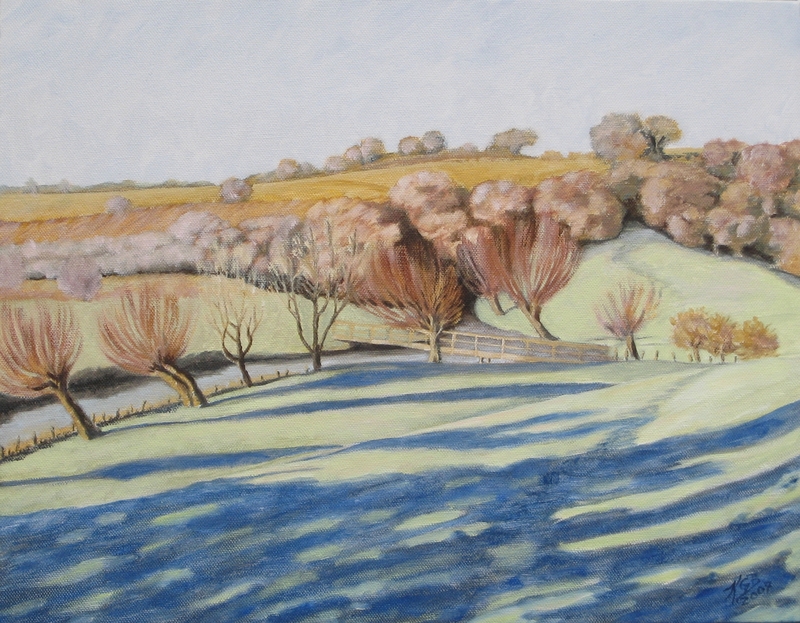 This painting began with the exposed roots forming natural steps up the bank. Oil on canvas. 60 x 30cm. 2009. Not at all what the river is looking like at the moment! 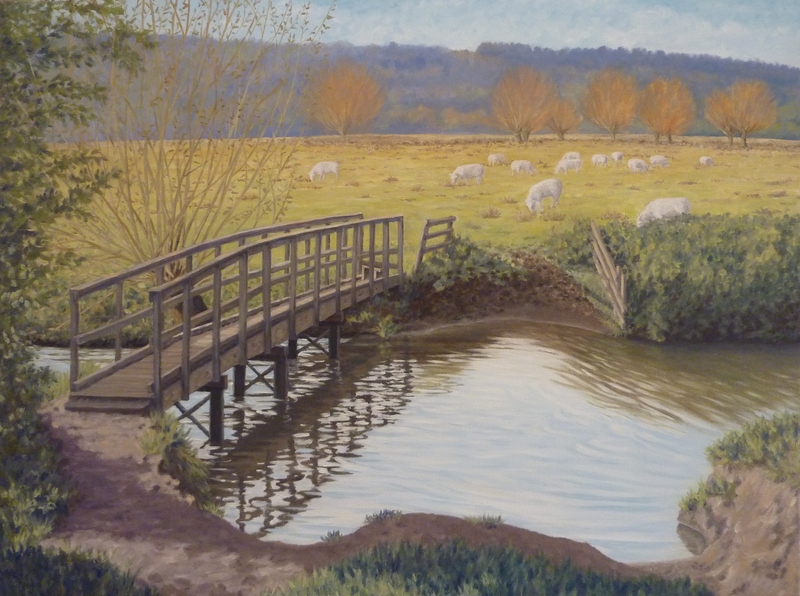 The river has spilled over into the field turning it into a lake, and is nearly over the top of the bridge; the sheep are definitely not grazing. This though is a favourite spot, peaceful and empty of visitors a lot of the time, but in better weather sometimes a busy-ish junction for walkers, dog-walkers, kids (and dogs) paddling, picnickers, a horse now and then, cyclists. And the occasional artist. Oil on canvas, 76 x 60cm, 2012. Available as an open edition Artist Quality Giclee Print. Image 260 x 355mm. Please enquire. I’ve included a bunch of things that mean Stonesfield to me. The first fossil identified as a dinosaur – was found in my village of Stonesfield, so I’ve painted that in too. Time-consuming to get all the elements to fit together, but fun. Framed Acrylic on canvas. Image 40 x 40cm. 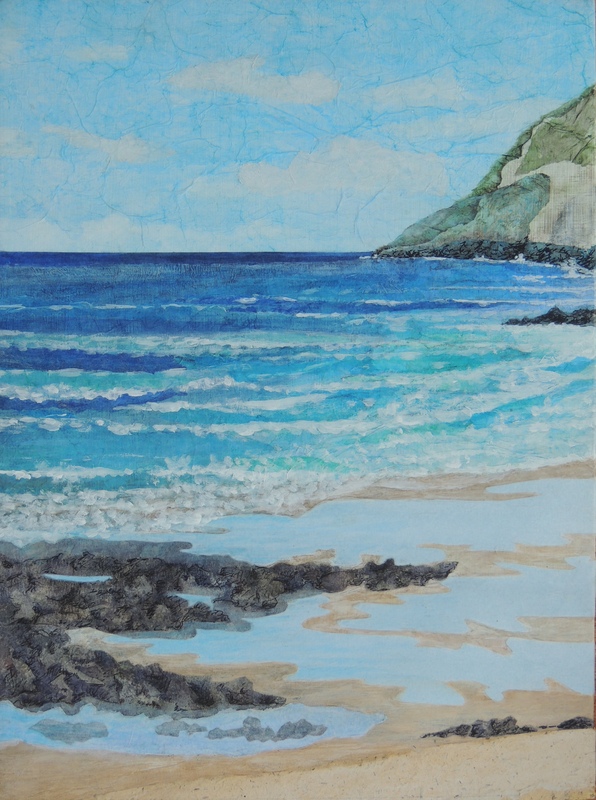 My slate paintings develop from what the irregular surface and shape of the slate leads me to see, within the bounds of sea or landscape and tree themes. Gesso on slate. Comes in an oiled wood box frame. Mostly (thus far) I have painted in oil and acrylic. But I enjoy other media too. So this (and others like it) I started doing a couple of years ago. 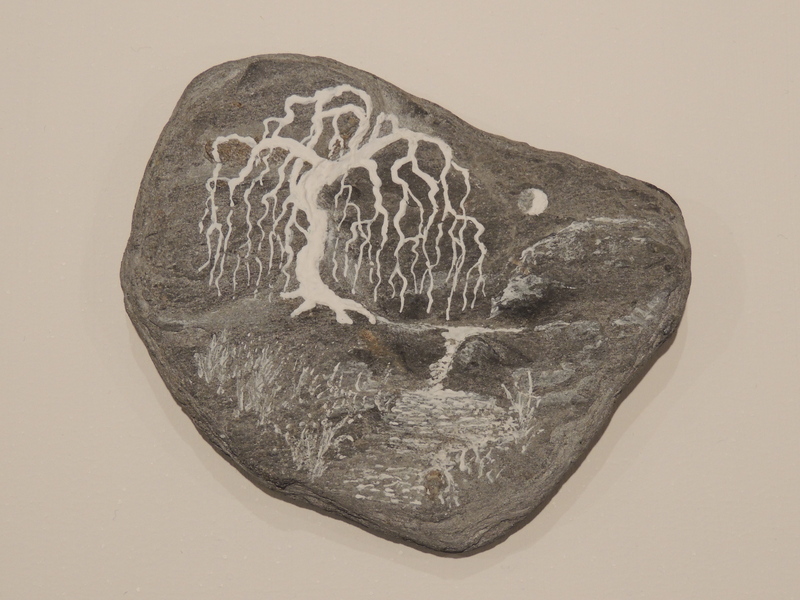 I was experimenting with layering up gesso on board for a painting of a tree and was doing it on a dark background, when a friend said, ‘that would look nice on slate’, and instantly I thought of my bits of slate picked up from the beach on holidays by the sea…So this is an example of the result. 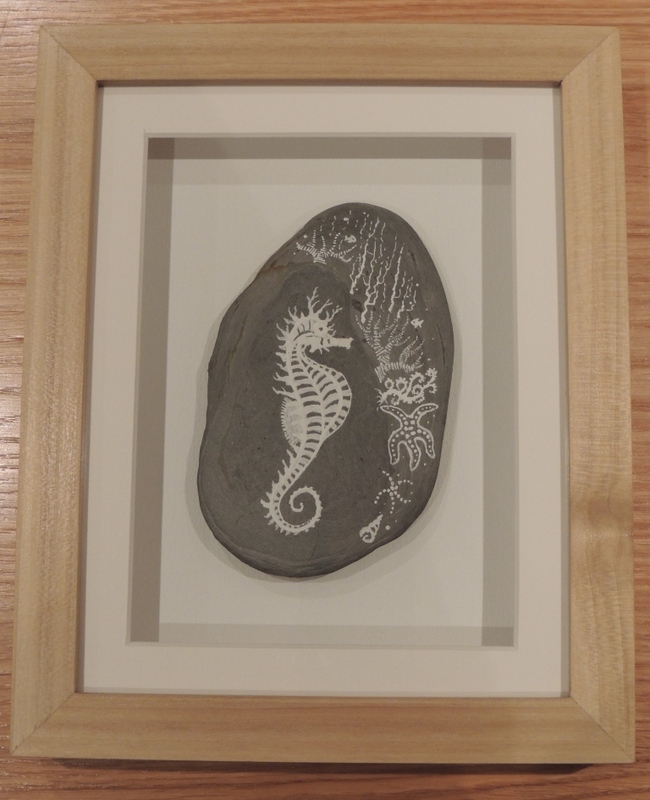 All my work; slate drawings, frames, mounts, and assembly. 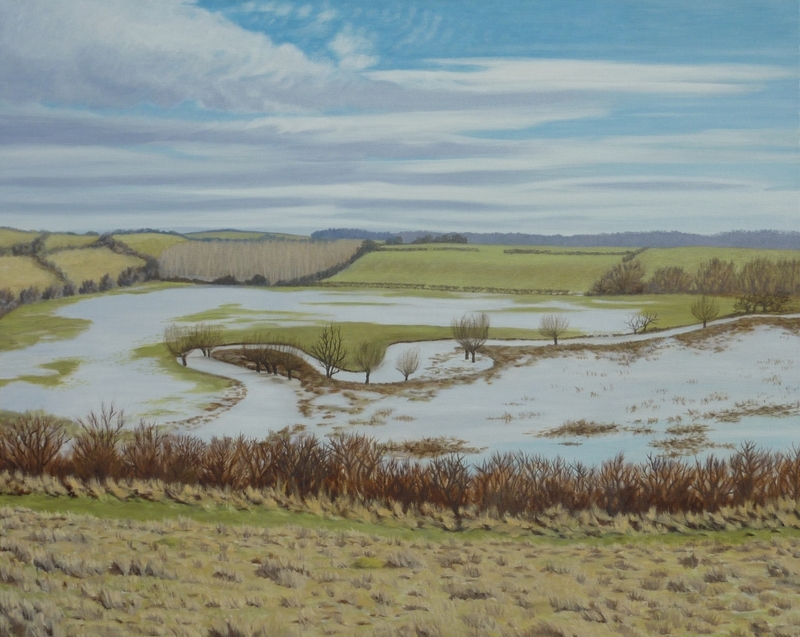 Late Autumn flood waters receding. Oil. 76 x 61cm. (Unframed) 2010. 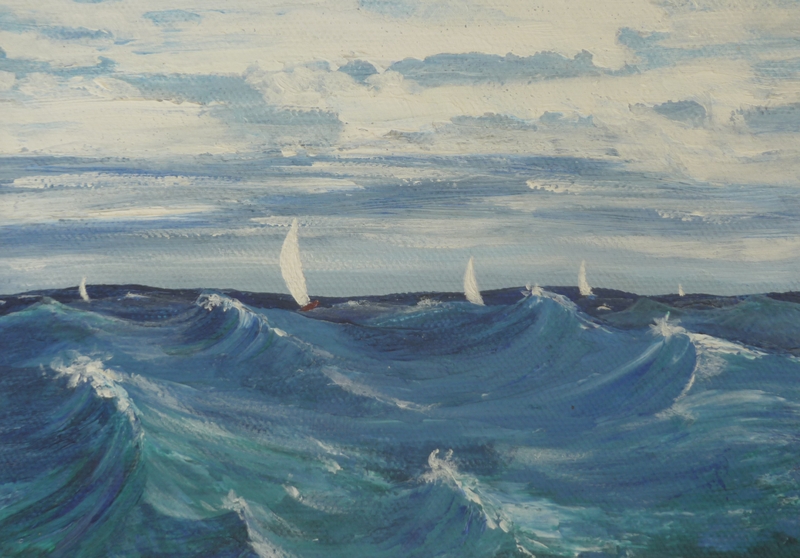 This was a (tiny) first attempt at using a palette knife instead of brushes and I like it because I think it succeeds in capturing the feel of being out on the sea. At any rate, it makes me feel cold and a bit queasy! Some have wondered how I knew how to paint this as they know I get motion-sick very easily. Done from memory from occasionally (unwisely) relenting and getting into a boat with my sailor husband! Acrylic on canvas board, 26 x 20cm, 2009. Sold.